When was Royal Arctic Line (RAL) established? How many vessels do you have and what kind of regular services do you provide. Who owns the company today? Royal Arctic Line is a Greenlandic Government owned company built on the foundation of the former Kongelig Grønlandske Handel (KGH) with roots going all the way back to 1774, a Danish Merchant Organization trading with and in Greenland. The name Royal Arctic Line, was introduced in 1993. Being the sole carrier, who is holding the concession to transport goods to 13 Greenlandic ports from the port of Aalborg in Denmark, it surely demands for trustworthy and reliable service all year around. Today Royal Arctic Line is a modern container carrier and transports all kinds of cargo. Throughout the year approximately 100,000 shipments are handled. Compare that to the population of approx. 50,000 scattered on an island covering 2,166,000 km² – 50 times larger than Denmark. You have services to Greenland in the Arctic, tell us a bit about the conditions under which you operate. What kind of weather do you encounter up there? What type of vessels do you have for this particular traffic and what kind of problems/restrictions do you face? We like to see ourselves as a lifeline to society in Greenland. This means that we have obligations to solve all kinds of transports, small, big, light or heavy. The waters we sail are often harsh and dangerous, but safety always comes first. Our fleet covers geared containerships from 250-730 TEU. A total of 5 ships who can cross the Atlantic ocean on the 2,800 nautical mile journey from Denmark to the cities on the Greenlandic West coast. We also employ 6 minor ships which serve about 80 of the small settlements (from 10-150 inhabitants). There are days with extremely low temperatures where our ships can be covered with ice, adding substantial amount of tons, endangering the sailing. Storms in the Atlantic Ocean can cause more than 10 meter waves with the risk of loosing deck cargo. Despite these conditions Royal Arctic Line has experienced very few incidents resulting in damage to containers or even loss. Are you able to or have you ever carried cargoes coming from outside Denmark to Greenland? If any of our readers have a project to Greenland can they approach you for a quote if they deliver the cargo to Denmark? During the years 2011 and 2012 the activities in search for oil outside Greenlands West coast meant that our ships northbound were utilized to a maximum for a long period. In order to serve the clients best possible we also made several calls in Scotland to collect drilling equipment and machinery. However our obligation towards the fixed schedule to serve our customers in the Greenlandic Ports must never be questioned, so such kind of deviations are rarely executed. With that said, we will of course always consider all relevant inquiries, with respect to and in the interest of our business. Give us some examples of projects that you have carried to Greenland, size of shipments, type of cargo etc. Unfortunately we are not able to say that the sky is the limit. Our ships are geared but limited to lift about 75 metric tons in twin-lift. Every year we have 2 sailings to Thule Air Base (USAF) carrying all kind of cargo such as machinery, asphalt plants, concrete elements and building materials. We always aim to arrive as soon as the ice has disappeared from the bay after a long winter in order for our clients to be able to complete their program during the very short summer, when the sun is up 24/7. Some of our jobs we even involve delivery to remote areas where it is necessary to carry barges and trucks on our vessels to land the cargo on shore. It calls for precise planning and caution. Do you also carry export cargoes from Greenland back to Denmark? If so what kind of commodities are transported? Fish and scrimps are the main products which are exported from Greenland. Do you have your own containers? Do you accept shippers own containers? Do you carry other shipping line’s containers to and from Greenland? Our container fleet consists of a wide range of container-types. Basically we have all types available (except 40’OT). The demand for reefers is of course essential, for carrying fish products from Greenland to the export markets overseas and transporting consumer goods from Europe and Denmark to Greenland. Royal Arctic Line accepts Liner Equipment from a few other shipping lines, however the majority of shipments end in Denmark, where the fish and shrimp are stored temporarily in coldstores before being shipped to their final destinations overseas. We also welcome shippers own containers. Flatracks are not only used as one single transport unit, but very often we use them to build extra decks to enable us to carry 20 meter long boats and mining equipment. Do you sometimes call other destinations in the Arctic besides Greenland? Iceland, Northern Canada and Russia for example. 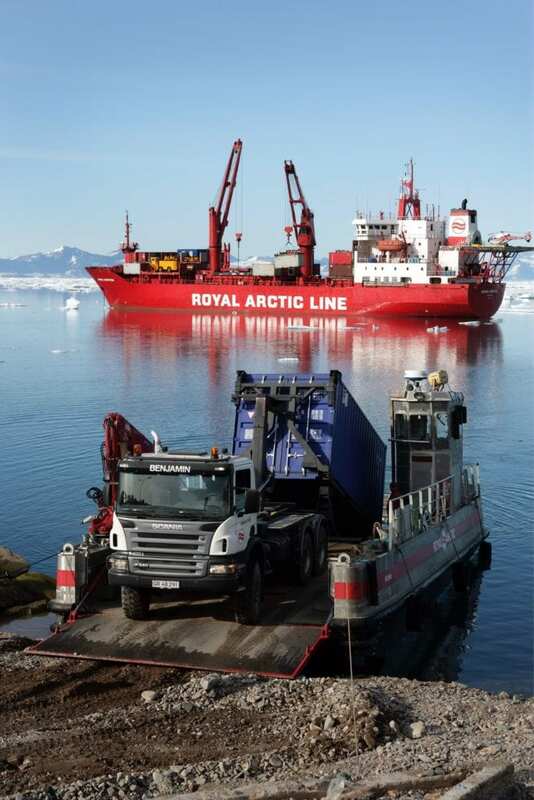 Royal Arctic Line, makes regular calls in Icelandic Ports every third week to load cargo coming from Northern America and Iceland, and at the same time discharges cargo of Greenlandic origin. Commodities are mainly fish products, consumer goods, building materials and machinery. The service is operated together with our partner Eimskip, taking advantage of its network outside of Greenland which is our core-business. As all our ships were built with the highest ice-class we are able to go almost anywhere in icy waters. During the last 7 years we have arranged a yearly sailing from Europe to the Antarctic to deliver supplies and fuel to some of the bases operated by various nations in this remote area. Whom to contact for rates and quotations at RAL? What crane capacity do you have on your vessels? Are there any mobile or floating cranes available in Greenland for very heavy cargoes? No floating cranes are available in Greenland, accordingly heavy-lifts more than 75 tons must be performed by charter which has been granted a waiver from the Greenland Government before entering one of the nominated 13 ports. In the port of Nuuk, a new container terminal will be opened in the late spring of 2017. Crane capacity will be increased to about 120 metric tons, based on the new mobile shore cranes. I met you in Hanstholm in Denmark in 1983-1984 I believe. What is your history in the shipping industry? As youngster I joined the Danish Navy, which also gave me the chance to experience life in Greenland. From then I knew that shipping would be my future living. My career has been both in shipping and in the forwarding industry, where I have worked with projects and in particular within sales. 15 years in Schenker gave me the opportunity to arrange Project-transport/Heavy Haulage all over Europe, also using European Waterways. As Key Account Manager I was often required to travel to South America. In 2009 I started at Royal Arctic Line in Aalborg. Why do you like being involved in shipping? One day is never the same and never predictable, the daily challenges to organize and execute complicated transports on behalf of our customers has always given me great pleasure. Right now the shipping industry is struggling hard, which makes it difficult for many of us. However I am confident that our innovative and talented industry will overcome the situation and I believe that 2017 will bring better prospects. Therefor you will never find a more interesting job.